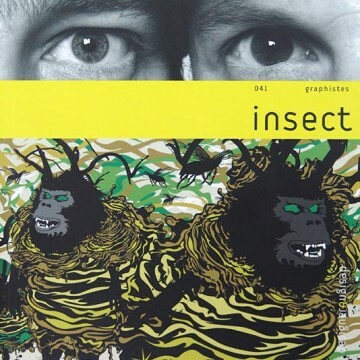 Design & Designer 041 – Insect, official blurb: London graphics duo, founded in London in 1998, divide their time between commissions and experimentation, and draw much of their inspiration from urban culture (hip hop, graffiti, etc.). London's Victoria and Albert Museum has acquired some of their most recent personal pieces. A highly versatile pair, Paul Humphrey and Luke Davies are also musicians with their electronic-music bands The House of Fix and Wolves. Their shared fascination with hexapods and dark atmospheres has spawned a disquieting and colourful world inhabited by chimeric and monstrous creatures. Their output is a blend of illustration, typography and photography. They work both for indie music labels and for international companies such as MTV, Adidas and Motorola. For the past two years they have been helping promote street artists such as Banksy through the online art gallery Pictures On Walls.